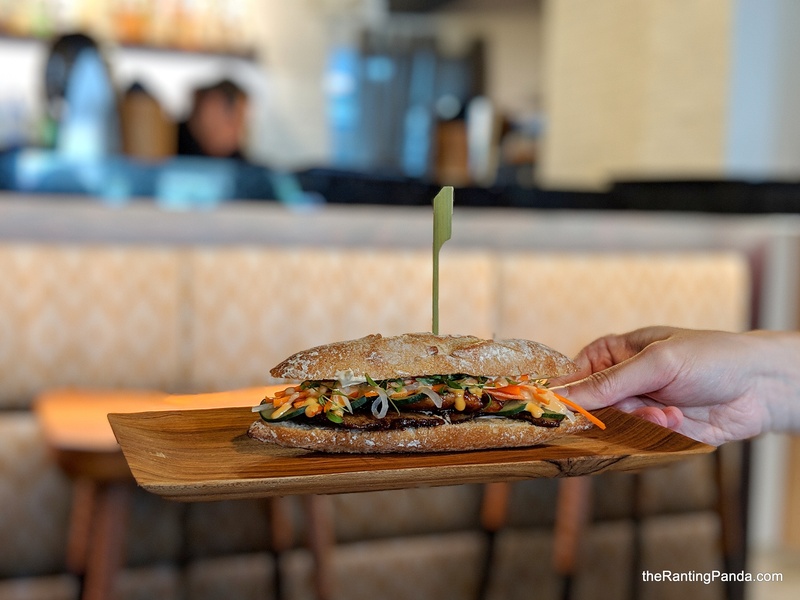 The Food Located along Boat Quay, The Sampan is a relatively new three-storey shophouse restaurant facing the Singapore River just a few doors down from Michelin starred restaurant Braci. Sampan refers to boat, where the name of the restaurant pays reference to the busy port days of the Singapore River where many boats passed through. The first level of the restaurant is a more casual set up, more suited for quick bites and drinks by the bar. Level two is more ideal for dining as it is more spacious, with ample natural light in the day. Level three of the restaurant spots a more private space reserved for private dining or events. The Food The concept of the food is Pan Asian flavours, hence the menu is a mix of various Asian influences such as Vietnamese spring rolls, Chinese ingredients and Sri Lankan curry. The concept is good sharing, hence it is more ideal for groups where you can order some large and small plates to share. Some bites to start are the Pork & Chicken Choi Bao with Water Chestnut & Lup Cheong ($4) and Mushroom San Choi Bao (S$4), black fungus, enoki and shiitake mushroom. Both finger size bites are wrapped with cabbage, with the latter being a vegetarian option. The pork and chicken flavour has a much heavier taste than the mushroom for sure, though I find that both versions lean towards the oily side. For salad, I tried both the Blue Swimmer Crab & Pomelo Salad (S$14) and the Crispy Chilli Beef & Mango Salad (S$18) with crispy noodles. Both salads are quite light and refreshing, though I prefer the latter which has that added crunchy texture due to the crispy noodles. The portions are quite good to share between two to three persons. An addictive starter to have is the Szechuan Pepper Chicken Spare Ribs (S$12), where the thin strips of chicken are fried to golden brown texture. The marination of the chicken is not too bad, which lends it a tender and flavourful taste. That said, the Szechuan pepper element is lacking. Other dishes I had include the Pani Puri with Stracciatella & Curried Lentils (S$6), and the Banh Mi (S$12). The Pani Puri here is a reinterpretation of the Indian snack where you egg cucumber and mint yogurt within the crispy dough. It is easy to pop and it’s gone in the mouth within seconds. Conversely, the Banh Mi here doesn’t taste like the traditional ones I had in Vietnam. The thin and rather tough baguette here is stuffed with braised pork neck and foie gras with Sriracha mayo. I didn’t quite enjoy the braised pork here as the flavour is quite one-dimensional for me, while the Sriracha sauce lacks the punch I expected. Skip this. For desserts, I tried both the Mango Pudding (S$12) with coconut sage and mango sorbet; and the Valrhona Chocolate & Tofu Mousse (S$12) with Chai Spiced Shortbread, Passion Fruit Curd. I prefer the former as the lighter flavour feels more balanced for me after the relatively heavy flavours of the dishes. The chocolate and tofu mousse combination does not really work for me, as I find that it doesn’t blend very well together. Rants The themes of Pan Asian cuisine and The Sampan do not quite gel intuitively at first glance. It’s a little like a jack of all trades, but a master of none from the dishes on the menu. Will I Return Again? Prices at The Sampan are relatively wallet friendly for Boat Quay. I would say it’s worth trying with a group of friends or colleagues, with some hits and misses on the dishes for me.